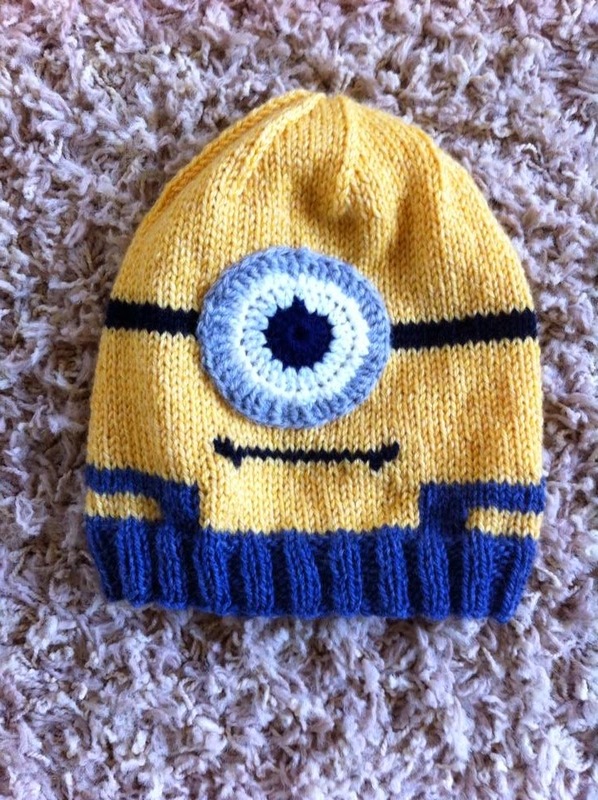 If you search Ravelry, I'm sure you'll find some cute minion hats - they are out there - but they are all missing one key feature - the overalls! You can't make a minion without the overalls. It's like s'more without the chocolate. Cascade Superwash 220 in Colonial Blue Heather (904), Lemon (820), and scraps in black, white, navy, and grey. Cast on 88 stitches in Colonial Blue. Place maker (important), join and work in a knit 2, purl 2 rib for 10 rows. Work next row in all knit stitches in Colonial Blue. For the next few rows you will be carrying colors not in use on the inside of the work. It is very important to make sure that you leave enough yarn inside the work for the piece to stretch. This is a rather difficult balance to master so that the yarn inside isn't too loose or too tight - it may take a couple attempts if you have not knitted with multiple strands at the same time. Rows 1-3: Knit 10 in Lemon, Knit 4 in Blue, Knit 16 in Lemon, Knit 4 in Blue, Knit 20 in Lemon, Knit 4 in Blue, Knit 16 in Lemon, Knit 4 in Blue, Knit 10 in Lemon. Sew up remaining stitches and firmly attach. Weave in all loose ends (will be quiet a few). With navy yarn and size f crochet hook, chain four and join. Chain 2 then double crochet into loop 15 times and slip last stitch to first chain. Switch to white yarn and double crochet into each stitch on the previous round twice. Work two rounds in White, then switch to grey yarn and work around eye again in grey. Sew eye onto hat so that it is centered about mouth and on the black band. this is adult size I believe. She made it for her sister.